The Supreme Court on Feb. 26 will hear Janus v. AFSCME, the third case in recent years that asks the justices to consider whether forcing public employees, like teachers, to pay union dues violates their First Amendment rights. Unions say that fees some workers pay (dues, minus funds for political activity) prevents “freeriding” employees from benefiting from union-negotiated contracts without paying their fair share and makes it easier for governments to negotiate with one representative of all employees. Those opposed to so-called agency fees say that even standard bargaining issues, like salary and layoff policy, are inherently political and that forcing employees to support unions is unfair. Although the majority of Puerto Rico’s schools are back up and running after Hurricane Maria devastated the island last fall, work to repair the island’s tattered education system has just begun. In 2018, Puerto Rico Education Secretary Julia Keleher will continue an ambitious campaign to reform schools that have struggled for years. In 2018, we’ll no doubt see school districts, states, and perhaps even the U.S. Department of Education tout the latest uptick in high school graduation numbers. Yet we seem to have reached a tipping point when it comes to such statistics. With a surge of reports of grade inflation and rigged diplomas on the one hand, and an increase in expensive college remediation on the other, skeptics are looking beyond the numbers to ask: What’s the real value of a high school diploma? Two years after crafting the Every Student Succeeds Act — the bipartisan K-12 lovefest law now turned perpetual point of contention — lawmakers are moving to a rewrite of the Higher Education Act. The reauthorization will touch on contentious issues such as student loans and grants, regulations of for-profit colleges, and sexual assault on campus. A GOP-authored bill passed out of the House Education and the Workforce Committee in December and is expected on the House floor in early 2018. Rhode Island may be the smallest state, but it has become a national leader for its statewide $2 million personalized learning initiative. Summer 2018 marks the end of the first year of Rhode Island’s Lighthouse Schools, three schools awarded grants in an effort to cultivate best personalized learning practices to share with other schools around the state. Some educators have already started visiting these learning labs to see what practices they can bring to their own classrooms, but a more formal process for reflecting on and sharing their work will be developed this summer. As Louisiana’s Recovery School District completes the process of returning New Orleans schools to a locally elected school board in 2018, the nation’s most dramatic modern school reform effort will enter a new chapter. Following a decade of radical change and policy innovation, the performance of the city’s mostly public charter schools went from the systemwide equivalent of an “F” to a “C.” But 10 years after Hurricane Katrina, school performance flattened and then, in 2017, actually dropped. Despite continuing coverage over the past years, a great deal remains unknown about Renewal schools and how the students in them are learning. How is the city’s hundreds of millions actually spent? What does the Renewal program’s administrative structure — as large as many districts — look like: Who makes decisions, what is City Hall’s role in the division of labor, why do many principals hate how the schools are managed? Have Community Schools and their wraparound services for needy students and families helped, hurt, or both? How are they funded? 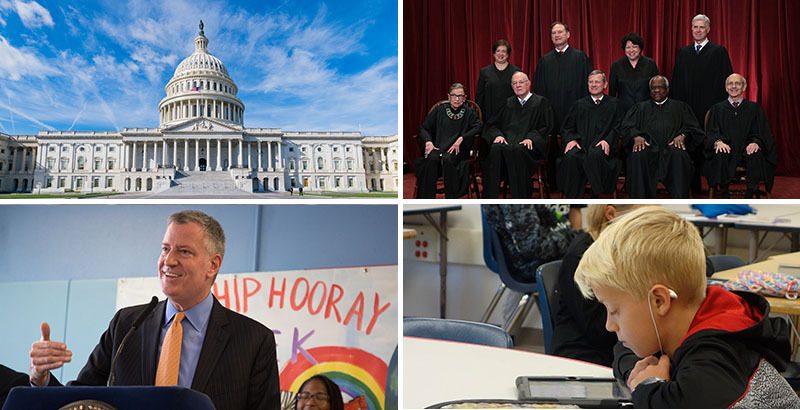 Is Mayor Bill de Blasio’s new designation for the 21 Renewal schools that are doing better — now called Rise schools — meaningful, rigorous, arbitrary? How much improvement is reasonable to expect from a long-failing school? What are the success stories? The Supreme Court last year unanimously rejected the idea that schools are complying with the Individuals with Disabilities Education Act if students with special education needs receive a “barely more than minimal” educational benefit. “When all is said and done, a student offered an educational program providing ‘merely more than de minimis’ progress from year to year can hardly be said to have been offered an education at all,” Chief Justice John Roberts wrote for the court in Endrew F. v. Douglas County School District. Instead, the justices decided, schools should make sure students’ Individualized Education Programs are “reasonably calculated to enable a child to make progress in appropriate light of the child’s circumstances.” The Education Department released a Q&A document to help districts better meet the new standard. As the Trump administration puts all Obama-era policies under a microscope for potential revocation, advocates on both sides of the school discipline debate are bracing for big changes in 2018. Already, Education Secretary Betsy DeVos has scrapped similar guidance that had aimed to protect transgender students and survivors of sexual assault. Now, her department is looking at 2014 guidance that had called on schools to rethink punitive school discipline, including suspensions and expulsions, and warned districts that racial disparities in suspensions could violate federal civil rights laws. Research shows that social-emotional learning leads to positive outcomes, from grades to graduation rates, which is why education leaders from the classroom to the federal government are trying to make sure that schools are teaching more than academics to their students. School segregation and integration will continue to occupy a spot near the top of education reporters’ agendas as the 50th anniversary of the landmark Fair Housing Act of 1968 — sometimes referred to as the Civil Rights Act of 1968 — approaches. Most states have struggled over the past decade to respond to the shock and awe of paying for their workers’ pension plans. For the most part, the extent of the problem hasn’t taken hold of the public imagination despite innumerable warnings from bankers, financial publications, state politicians, and think tanks, along with a steady heightening of the stakes each year. Given the very large spike in baby boomer retirements expected in coming years, the consequences could be enormous and affect nearly every area of domestic policy. The issue has gained some traction in a few states’ electoral races. In California, which faces nearly half a trillion dollars in unfunded liabilities, pension payments have figured in the gubernatorial campaign. The crisis is clearly being felt in Illinois, where pension payments have risen from 5 percent of the state budget in 2011 to 25 percent this year. Every household in the state owes $27,000 in pension debt, according to the Illinois Policy Institute, and the state’s total $130 billion pension liability has begun to significantly erode funding for social services and education. The problem is so acute in Chicago that it came near to sparking a strike and forcing schools to close.